The 10G SFP+ module realizes the DDM by the serial interface. Our hot-pluggable and small package 10G SFP+ module is mainly designed for the connection for the 10G Ethernet over the single-mode fiber. Our series of 10G SFP+ fiber optic transceivers is in accordance with the standard of SFF-8431、IEEE 802.3-2005 10GBASE-LR/LW and 1000GBASE-LX. The DDM function is realized by a 2-wire serial interface which is defined in SFF-8472. 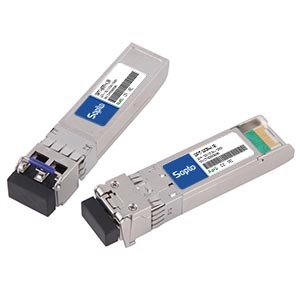 We also provide “limit type SFP+ optical modules” whose receiving part uses a restricted type detector. This SFP+ fiber optical module is in accordance with the related lead-free clause of RoHS and EU 2002/95/EC. For other question and information, please contact our customer service for the latest information.